tl;dr: there’s more to get nostalgic about as you get older. what else is new. Not sure what point, if any, “Paul” was trying to make. This was a very nice piece. I still have a few VHS movies in a box somewhere and feel the same sense of nolstalgia you do. Thanks for illustrating it better than I could. This was lovely. Some of my favorite times as a kid were going into the ‘Video Plus’ shop in our town to battle with visiting cousins over whether we would rent Pink Panther films or the current horror flick. I can honestly say I haven’t since gotten the same palpable feeling for watching a film then when we would load up in the car, wander into the video store, finger the boxes, playfully debate the merits of this or that one and end up at home, all six or twelve of us hushed in silence as Peter Sellers or Peter O’Toole popped up on our heavy TV screen in our ugly Arizona living room. Pushing that VHS tape into the player and yelling ‘Everybody, quiet, the the movie is starting” was when I started the affair with films from which I have never waivered. Our timelines matchup: I too worked in a Blockbuster in the 90s and watched as many VHS movies as I could get my hands on. I feel like I’ve seen every movie made between, say, 1986 and 1996. 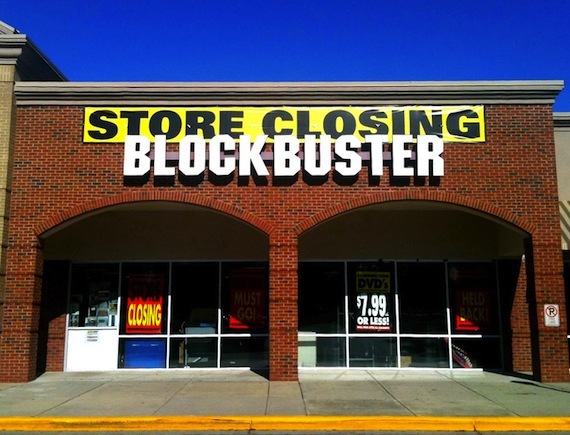 But also like you, I didn’t really feel anything when I heard that Blockbuster closed. Which is kind of strange given how much I enjoy movies. Thanks for writing this: always good to discover someone else has experienced the same thing in such a visceral way.